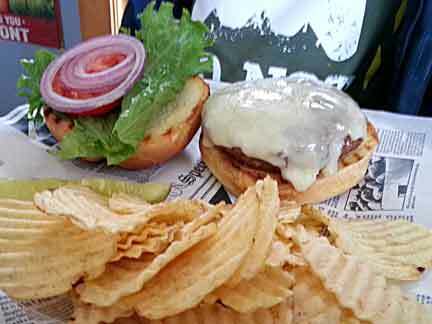 The Tavern on the Hill restaurant in Newport, Vermont is a nice place to grab lunch or spend happy hour. The large bar area is perfect for meeting up with friends because it’s U shape allows a group of people to sit comfortably while still being able to see one another. This also makes it a fun place to watch football. There isn’t a lot of seating in the dining area so getting a table on a busy night is difficult. That is why I like to come here at lunch. Though many bars or taverns serve food, The Tavern is a step above the rest. Their menu doesn’t contain your standard, pre-frozen, run of the mill items. Instead , most have a zesty, spicy quality and if they are pre-frozen, most don’t taste that way. At different times we have tried the wings, nachos, mini tacos, burgers, the pulled pork sandwich, and the buffalo chicken wrap. The last time I was there, I took my son – a 13 year old burger critic! And we were very surprised. I hadn’t eaten here in a while, and the previous few visits had been just for apps and drinks with friends. I ordered fish and chips, and my son ordered a bacon cheese burger. When my meal came, I remembered why I liked the place. The portion was huge for starters. Often when I order fish and chips I get a few 1-2 oz. pieces over a pile of fries. This was not the case this time. A got a large filet, fried crispy. 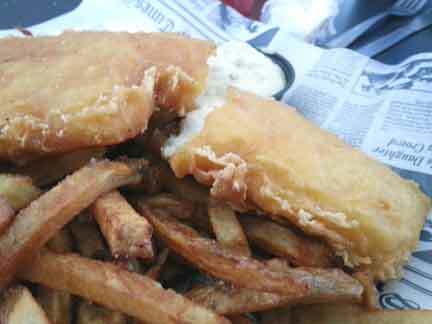 There wasn’t a half inch of soggy, tasteless batter encasing the fish – instead that batter was flavorful, and the fish was well cooked. A look over at my son told me he was happy with his meal. The burger was thick and juicy. He had ordered his cooked medium rare, and it was done to perfection. 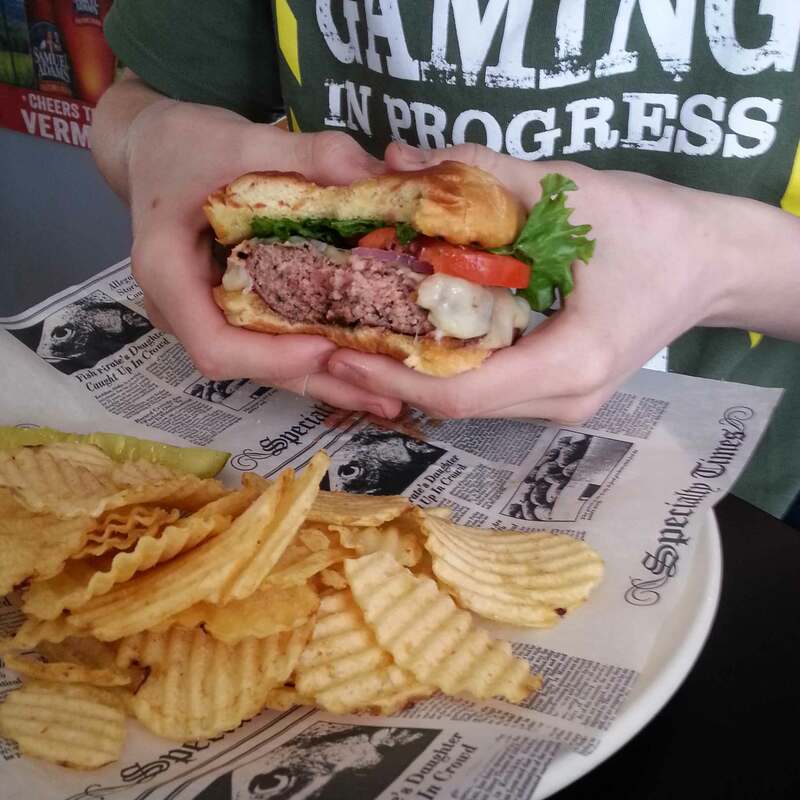 Even that burger couldn’t hold up to a teenage boy’s appetite, but judging by the size of it, I don’t think I would have been able to finish it. The lunch time crowd on a Thursday was pretty good. The bar area was mostly full, but the dining area had tables open. Service was a little slow, but there was only one person on the bar and she was waiting tables as well so I didn’t judge too harshly. But the gal was nice and checked in on us a few times so we enjoyed our lunch. Come happy hour the place becomes more like a bar, and there is often live music. I would recommend trying the Tavern on the Hill if you’re looking for a fun atmosphere to enjoy good tavern food, simple fare cooked very well, or a place to get a few drinks with friends. 1 Pings/Trackbacks for "Tavern On The Hill: Pub Food That Will Surprise You"